It’s now easy to download a video from Facebook Messenger on both a mobile phone and PC. As you start to play the video on Facebook Messenger, tap and hold the video. 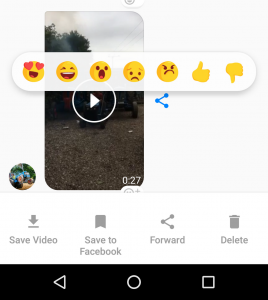 As well as emojis appearing over the video, you will see several options under the video. Generally, these are ‘Save Video’, ‘Save to Facebook’, ‘Forward’ and ‘Delete’. By selecting ‘Save Video’, the video will be downloaded into the photo/video gallery on your phone. If you choose ‘Save to Facebook’, this will save the video in the ‘Saved’ section of your Facebook profile. Double click on the video you want to download from Facebook Messenger to open it in full screen. Move your cursor up towards the top left of your screen and three options will appear – ‘Download’, ‘Forward’ and ‘Info’. Simply select ‘Download’ to download the video to your computer. The video will be automatically saved wherever you save downloads by default.